I tried a new cinnamon bun recipe on the weekend. They didn't turn out very well, actually they were reminiscent of a good ol' hockey puck in weight and texture. I'm not sure if it was the dough hooks coming loose in the bread maker, or the 3 eggs making the dough so very tough, or if it was the addition of sour cream, all I do know is the recipe sucked. has. Reliable like a good friend is this recipe. The dough came out of the bread machine ready and willing to be flattened, sprinkled, rolled and cut before heading for the pan for some much needed rest and quiet time. One hour to be exact. Then on cue the buns rose to the challenge before heading into the pre-heated oven for a bask in the warmth. 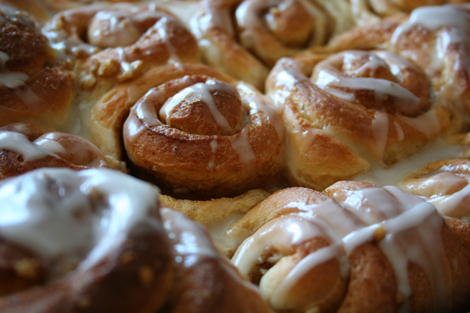 At last we have some delicious, soft, air-filled cinnamon buns. With a gentle drizzle of icing sugar the buns were quickly snatched up by the long suffering crowd who really had been waiting so very long. But for you I'll give it to you right the first time. Place ingredients in pan in order listed and set machine to dough setting. Sit back and make a cup of tea, knit, read a book, etc. When the dough cycle is complete let it rest for about 10 minutes then remove dough to lightly floured surface. Roll or pat to a rectangle, at least 9 x 12 but I like to make mine bigger. Brush with 1 TBSP (or more if you like) of melted butter. Mix together and sprinkle over dough. 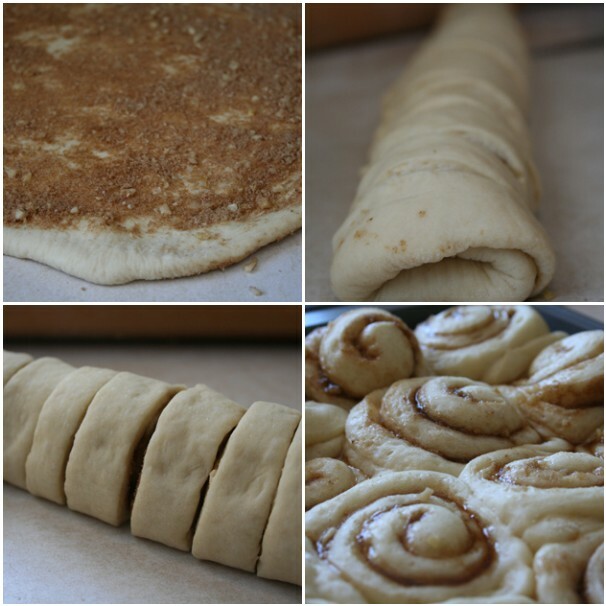 Starting with the longer side, roll up dough tightly. Pinch edges to seal. Cut into 24 slices for smaller cinnamon buns (my favorite way) or 12 slices. Place in 9 x12 pan (grease it if you think you are going to have a problem). Cover, let them rise until doubled. Bake at 375 F, 20-25 minutes. I am off to make these now since I am sure they are long gone and you will not bring me one to class tonight! looks absolutely delicious! i made some the other day that turned out a bit dry. but these look perfect. I haven't baked cinnamon rolls in quite a while ... I'm going to have to make some now after seeing this post! Mmm mmm! Let me know how the recipe goes. I went to bake them the other day and drat, wouldn't you know it, we didn't have any eggs in the fridge. It's making the argument for owning egg laying chickens even stronger.